Brian D. Cain, PhD, is a Professor of Biochemistry and Molecular Biology at the University of Florida at Gainesville. Dr. Cain received a B.A. in Molecular, Cellular and Developmental Biology from the University of Colorado. He moved to the University of Illinois, Urbana-Champaign for graduate studies earning a Ph.D. in Cell Biology in 1983. His dissertation focused on phospholipid metabolism and photosynthetic membrane biogenesis. In order to train in the application of modern molecular biology approaches to membrane science, he pursued postdoctoral studies at Stanford University. Dr. Cain joined the faculty of the University of Florida as an Assistant Professor in 1988 and was promoted to Professor in 2000. His laboratory has received numerous awards from the National Institutes of Health. Significant career activities include serving as Chairman of the NIH Physical Biochemistry Study Section, and participation on the NIH studysections for the Specialized Centers for the Protein Structure Initiative and the George M. O'Brien Kidney Centers. He also served a term on the editorial board for The Journal of Biological Chemistry. Dr. Cain chaired the 2011 Molecular and Cellular Bioenergetics Gordon Research Conference. John G. Cleland, MD, FRCP (Glasgow & London), FESC, FACC, is Professor and Chair of Cardiology at the University of Hull. He qualified in medicine in 1977 at the University of Glasgow. He was appointed from 1986- 1994 first as a Senior Registrar and subsequently as Senior Lecturer in Cardiology jointly at St Mary’s and theHammersmith Hospital, London. In 1994 he was awarded a Senior Research Fellowship by the British Heart Foundation to transfer to the Medical Research Council’s Clinical Research Initiative in Heart Failure in Glasgow. He was appointed Chair of Cardiology at the University of Hull in 1999. His main interest is heart failure, extending from its epidemiology, detection and prevention, to effective implementation of existing treatments and planning of randomised trials of new (and old) treatments. Particular interests include the interaction between myocardial hibernation and treatment, ‘diastolic’ and vascular dysfunction, anti-thrombotic treatments, peri-partum cardiomyopathy, cardiac resynchronisation, telemonitoring, implantable haemodynamic monitoring, comorbidities including diabetes, anaemia, atrial fibrillation and renal dysfunction and new interventions for acute heart failure. Donald E: Kohan, MD, PhD, FASN, is a Professor of Medicine and Physiology at the University of Utah Health Sciences Center in Salt Lake City, UT. His research for over two decades has focused on kidney regulation of blood pressure and salt balance. He is specifically interested in the role of endothelins and nitric oxide in the control of renal sodium and water transport and blood pressure, and uses multiple transgenic and gene-targeted models. He is also involved inclinical studies using endothelin receptor antagonists to treat patients with chronic kidney disease. Dr. Kohan was Chair of the Ninth International Conference on Endothelin (ET-9), held in 2006 in Park City, UT. Dr. Kohan is a Fellow of the American Society of Nephrology and a member of the International Advisory Board of the International Conferences on Endothelin. John Pernow MD, PhD, FESC, is Professor and Head of the Cardiology Unit, Department of Medicine, Karolinska Institutet. He is also senior consultant of cardiology at the Department of Cardiology, Karolinska University Hospital. He is a member of the scientific council of the Swedish Heart and Lung Foundation. His research is focused on mechanisms behind and treatment targeting endothelial dysfunction with special emphasis on the role of endothelin in cardiovascular disease. 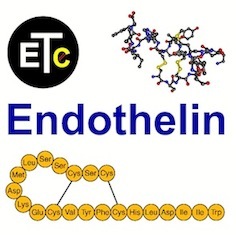 John Pernow has been active in endothelin research for twenty years and published several papers regarding the pharmacology and pathophysiological role of endothelin in cardiovascular disease and complications to diabetes. An additional research area is protection against myocardial ischemia and reperfusion injury in experimental and clinical studies. Dr. Pernow is a Fellow of the European Society of Cardiology and member of the Local Organizing Committee of the Twelfth International Conference on Endothelin (ET-12). Lewis J. Rubin, MD, FACP, FCCP, FAHA, FRCP, is Emeritus Professor of Medicine at the University of California in San Diego, School of Medicine and its emeritus director of Pulmonary and Critical Care. Dr. Rubin earned his medical degree from the Albert Einstein College of Medicine, New York, and completed a residency and fellowship at Duke University Medical Center. He has since had a distinguished career, being involved in the basic and clinical investigation of pulmonary vascular diseases for almost 30 years. He is co-author of nearly 200 peer-reviewed publications, more than 60 book chapters, and editor of five books on pulmonary circulation. He has served as the Principal Investigator/Steering Committee Chair for the pivotal trials of epoprostenol, treprostinil, bosentan and ambrisentan, and on the Steering Committee for the pivotal trials of iloprost and sildenafil in pulmonary hypertension. He has received numerous honours and awards, including being named a Fellow of the American Heart Association and an Honorary Fellow by the Royal College of Physicians, United Kingdom. Dan Theodorescu, MD, PhD, is the Paul Bunn Professor and Director of the NCI designated Comprehensive Cancer Center at the University of Colorado. He is also Professor of Surgery and Pharmacology and Attending Urologic Oncologist. Currently, Dr. Theodorescu has a focused clinical practice in urologic oncology with a special interest in bladder cancer and minimally invasive robotic surgery. Theodorescu is an internationally acknowledged leader in translational cancer research focused on identifying the molecular mechanisms leading to bladder cancer metastasis and their potential applications to patients with these diseases. Dr. Theodorescu has three significant accomplishments to date: The first has been the identification of a new metastasis suppressor gene, RhoGDI2, in human cancer. The second has been development of COXEN (CO-eXpression ExtrapolatioN) a new strategy aimed at personalizing cancer therapy. The third has been, gene expression and mass spectrometry based proteomics work that has resulted in the discovery of novel tissue and urinary biomarkers of bladder cancer. Paul M. Vanhoutte, MD, PhD, FAHA, is a Chair Professor in the Department of Pharmacology and Pharmacy of the Li Ka Shing Faculty of Medicine of the University of Hong Kong. He obtained his M.D. degree at the University of Gent, Belgium He has been Professor of Pharmacology at the University of Antwerp, the Mayo Clinic, Rochester MN, and Baylor College of Medicine, Houston TX. From 1992 to 2002, he was Director of Discovery Research at Servier near Paris in France. Dr. Vanhoutte is Doctor honoris causa of the Universities of Gent, Antwerp, Zürich, Montréal and Strasbourg, of the RMIT University in Melbourne, Australia, and of the Gr. T. Popa University in Iasi, Romania. Dr. Vanhoutte is a Highly Cited Researcher (ISI) in three categories: Biology & Chemistry, Pharmacology, and Clinical Medicine. Dr. Vanhoutte was Chair of the Third International Conference on Endothelin (ET-3) held at Housten in 1993 and Honorary Chair of The Ninth Interanational Conference on Endothelin held in Park City in 2005 and the Twelfth International Conference on Endothelin. David J. Webb, MD, DSc, FRCP, FRSE, FMedSci, is Professor of Therapeutics and Clinical Pharmacology in the BHF Centre of Research Excellence at the University of Edinburgh, where he established its Centre for Cardiovascular Science, and consultant physician at the Royal Infirmary of Edinburgh. He is recognised internationally for his work on endothelial function and arterial stiffness, much of which focuses on the endothelin system, and on the investigation and effective treatment of patients with complex hypertension and chronic kidney disease. His work is mainly translational and he provides leadership to two new UK clinical PhD training initiatives in translational medicine and therapeutics (TMAT) based in Scotland, funded by the Wellcome Trust and Medical Research Council. He is a Fellow of the Royal Society of Edinburgh and UK Academy of Medical Sciences, and was awarded the SKB Silver and Lilly Gold Medals from the British Pharmacological Society for his research and for contributions to pharmacology, respectively. Dr. Webb is a member of the International Advisory Board of the International Conferences on Endothelin and a member of the Local Organizing Committee of the Twelfth International Conference on Endothelin (ET-12) and was Chair of the Seventh International Conference on Endothelin (ET-7), held at Edinburgh in 2001. Masashi Yanagisawa, MD, PhD, is an Investigator of the Howard Hughes Medical Institute (HHMI) and a Professor of Molecular Genetics at the University of Texas Southwestern Medical Center at Dallas, where he holds the Patrick E. Haggerty Distinguished Chair in Basic Biomedical Science. Dr. Yanagisawa discovered endothelins, the most potent vasoconstrictors known. He identified their receptors and processing enzymes and demonstrated their role in the development of neural crest-derived tissues. He also discovered the orexins and their receptors, proteins that regulate food intake and wakefulness. Promising therapeutic applications have emerged from his extraordinary research. Dr. Yanagisawa is a member of the National Academy of Sciences (NAS) of the United States of America and member of the International Advisory Board of the International Conferences on Endothelin. Dr. Yanagisawa was Honorary Chair of The Tenth, the Eleventh and the Twelfth International Conference on Endothelin. Clinical Trials with ERAs: What Went Wrong and Where Can we Improve?